Beginning in 1863 the training hulks Britannia and Hindostan were moored on the river side of a hilly peninsula called Mount Boone, the majority of which was owned by the estate of Sir Walter Raleigh, who had received the property by Royal Grant from Queen Elizabeth I. The present buildings date from 1905, the architect was Sir George Aston Webb, one of the more distinguished of his day, whose previous commissions included Admiralty Arch and the East Front of Buckingham Palace. The foundation stone was laid by King Edward VII in March 1902 and the first cadets entered the College three years later. The bombing of the College in September 1942 forced a change in training policy and both staff and students were evacuated to Eaton Hall, Cheshire, until the end of the war. Bomb damage sustained to the quarterdeck in 1942 The Royal Naval College re-opened in September 1946 and although structurally it remained unchanged, the number and character of its courses was greatly expanded. By the mid seventies the number of graduate entrants had significantly increased. HRH The Prince of Wales was a graduate Sub Lieutenant in the Autumn term entry of 1971. The range of courses continued to expand. Two important new groups of officers came with the arrival of the Special Duties Officers Pre-qualifying Course, St. George, in 1974 and the WRNS Officers' Training Course, Talbot in 1976. 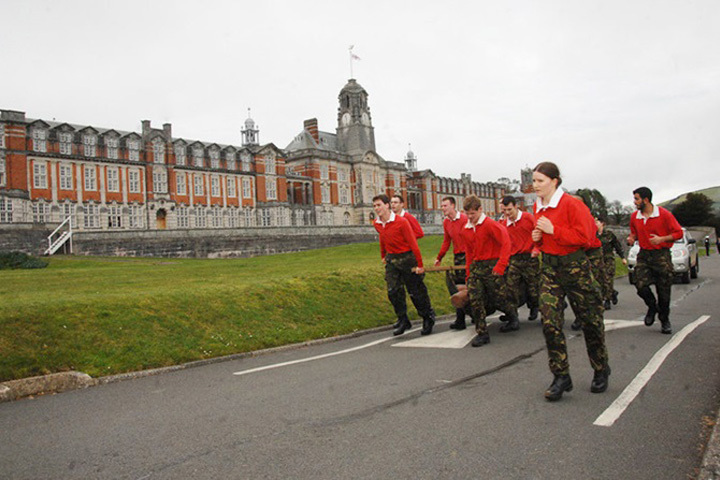 The training of female Naval Officers was integrated into that of their male counterparts in 1990 and the Special Duties Officers' Greenwich course moved to Dartmouth in 1996.